On Friday, I met with Uwe, Seth, and Mark at a ride share lot. I was the designated driver. With this group of accomplished mountaineers; the drive was sure to go by fast! 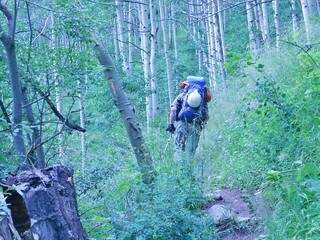 Uwe is a prolific trip leader for the CMC and has an expert command of CO peaks. Seth has the goal of climbing the 7 summits. Mark is a retired Ultra Runner, road engineer, and avid hunter. Conversation flowed easily the entire way to Telluride. 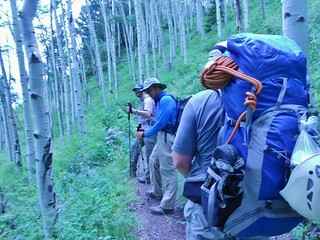 When we got to the TH and grabbed our backpacks for the hike up to basecamp. Somehow, Mark missed the memo; he thought we were car camping. No problem! I happened to have an extra pack in the subi, so in a few minutes, we shuffled all his stuff into my pack and we were off. 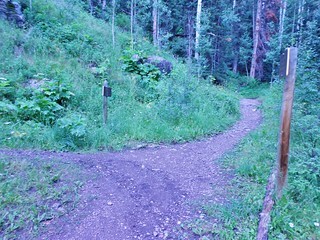 After 0.4 miles of hiking, we got to the Deep Creek trail intersection and turned left. 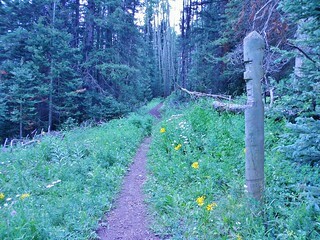 The Deep Creek Trail is beautiful. About 45 minutes into our hike, we reach this optional camp spot at 10,000 ft. You can see Dallas Peak covered in a cloud, on the left. 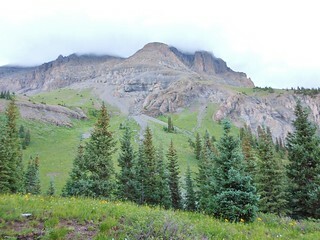 Uwe said he has camped here before, but prefers to go up to 11,340 ft, to improve the chances of summiting the next day. 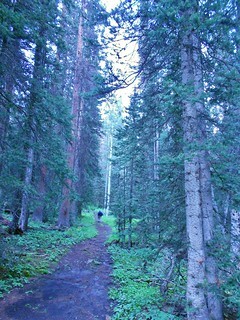 Taken from the same spot as the picture above, just looking back at the trail emerging from the forest. 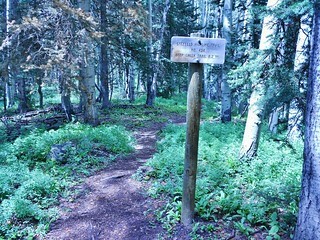 Still on the Deep Creek Trail, we go in and out of dense pockets of forest. It rained a bit on the way up to camp. 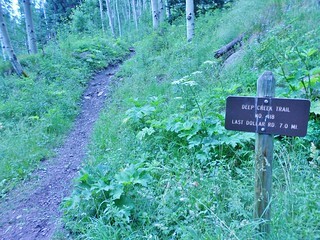 The intersection of Deep Creek with Sneffels Highline Trail. It took us 1.5 hours to reach this intersection, where we took a right turn and headed uphill. In this picture, our way is straight in front of me (because I’ve already turned right). 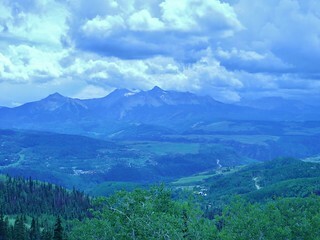 About 10 minutes from our right turn, we are rewarded with this view of Telluride Ski Resort. 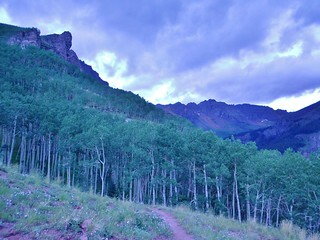 From the same spot as the picture above, just looking towards the Wilson Group. Taken from the same spot as the last two pictures, just looking at the path forward. The trail goes up this steep hill, to the left of the rocky outcrop. 30 minutes later, and the Wilson Group are completely socked in! 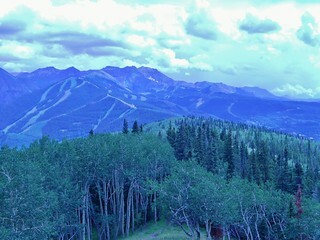 Let that be a lesson in how fast weather builds in the San Juans! 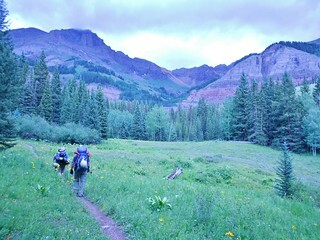 About three hours after leaving the trailhead, we arrive at basecamp. 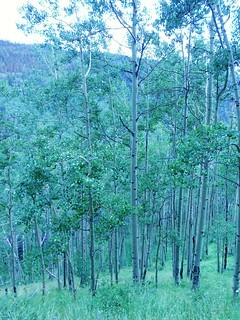 It’s a nice tree filled grassy shelf at 11,340 ft. There is an ankle deep creek beside us, which we can use to obtain water. Uwe says the last time he was here, it was dry. 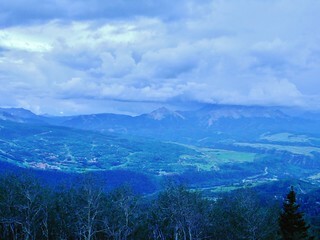 I notice some grey clouds moving our direction. Time for the tents to go up! Just as I’m pushing in the last tent stake, it starts pouring. We get a bit of hail and the wind gusts. I sit in the tent and wait out the storm. 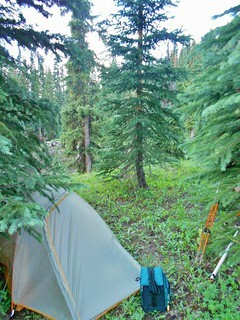 After an hour, it lets up, so we emerge from our tents and get to dinner. Uwe sets a wake-up time of 4am, for a departure time of 5am. We enjoy a beautiful and surprisingly humid evening. We all hope the weather holds over the course of the night. If the rock up there gets any more precipitation, it could make for dangerous climbing. This entry was posted on Friday, August 1st, 2014 at 9:20 am and is filed under Mountaineering, Rock Climbing. You can follow any responses to this entry through the RSS 2.0 feed. Both comments and pings are currently closed.